Aside from smelling like a wonderfully warm summer day in the garden, Geranium (also Rose Geranium – INCI: pelargonium graveolens) has several properties that makes it one of my absolute favorites and the essential oil a staple in my stock. I have used it in face oils and serums, as a middle note in different scent combinations (for creams or lotions), and as the star ingredient in a hair and body wash. The essential oil is made by steam-distilling the leaves of the plant. If you happen across a Rose Geranium (be sure it's a pelargonium graveolens), try and rub a leaf, then sniff your fingers where you just touched the plant – that's exactly what the essential oil smells like – fresh and gorgeous! Geranium essential oil has excellent staying power in scent combinations and blends beautifully with many other oils (for example the citrus oils). Aromatherapists will tell you that geranium is a 'lifter of the spirit' – I have often seen it referred to as 'the happiness oil'. In my experience, this is indeed true. 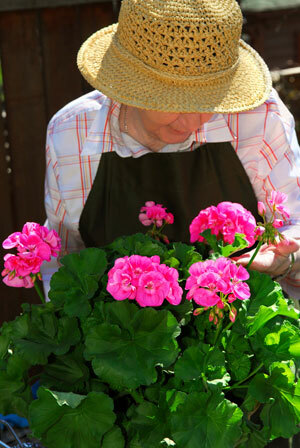 Geranium is recommended 'solely for morning use' as its 'powers of pick-me-up' are simply not condusive to sleep. I cannot agree quite as emphatically to this claim, but I can't entirely dismiss it either. My interest in geranium essential oil was really piqued when I read that it was helpful towards cell regeneration – particularly for aging or sagging skin. Bingo! The perfect combination: a beautiful-smelling, mood-lifting, fountain of youth in a bottle. Does it get any better than that? Squalane - Animal or Vegetable? Take Your Vitamin A - Topically!